Hiroshima Style Okonomiyaki (Japanese Layered Pancakes) – the ultimate savory pancake complete with cabbage, bacon, noodles, shrimp, and egg. So yummy! 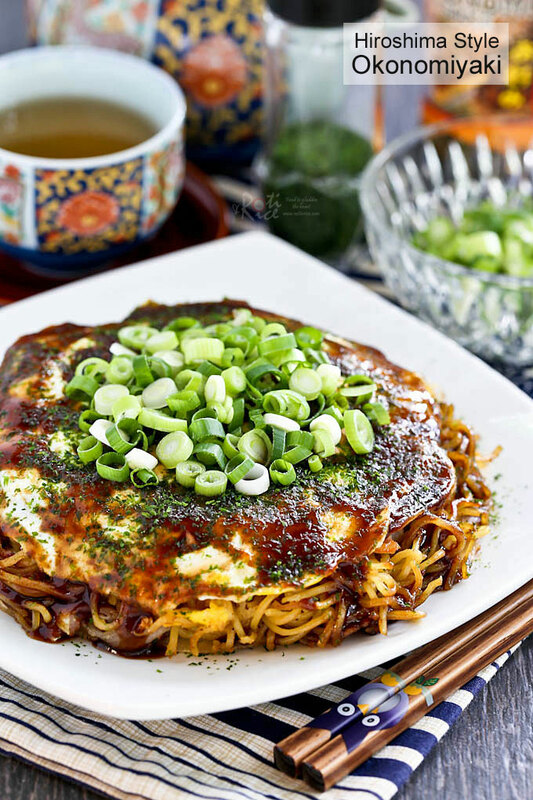 If you love pancakes and pan fried noodles, you are going to enjoy this Hiroshima Style Okonomiyaki (Japanese Layered Pancakes). 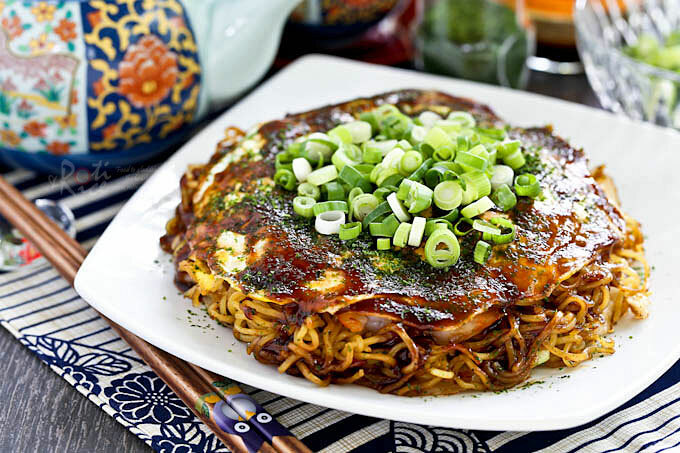 It is the ultimate savory pancake complete with fried noodles (usually yakisoba or udon), shrimp, cabbage, bacon, and egg all cooked into a huge tasty round. It is then slathered with a rich brown sauce to give it even more flavor. What is there not to love about this pancake? Little to none, because it is totally delicious! The basic ingredients are similar to its cousin, the Osaka style Okonomiyaki except for the addition of noodles. The distinction is in the cooking method. Hiroshima Style Okonomiyaki is a layered pancake with the batter making up only a thin layer at the bottom. Osaka Style Okonomiyaki is more floury and pancake-like with the ingredients mixed into the batter. Both are equally tasty and so it is a matter of preference. Okonomiyaki became popular in Japan during World War II when there was a short supply of rice. This pancake can be made with just a little flour and whatever vegetables and ingredients available. It was often served as a snack to children because it was filling. Today, cabbage appears to be the only must-have ingredient. The rest are “as you like it” although some specialty ingredients will make it taste a little more “authentic”. 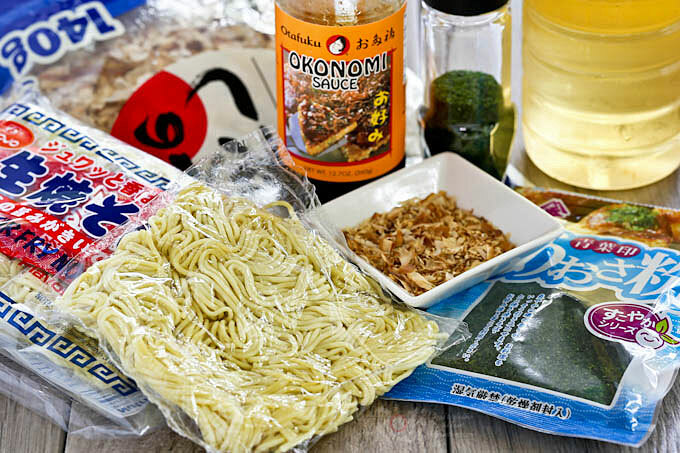 Okonomiyaki sauce, aonori (green seaweed flakes), and katsuobushi (dried shaved bonito flakes) can be purchased at many Asian grocery stores or on-line. Combine all-purpose flour and salt in a large bowl. Pour in 1¼ cups (300ml) water. Gently mix until just combine. Preheat a large non-stick electric griddle (or large non-stick pan on the stove) on medium heat. Brush griddle with a little oil. Spread a ladle of the batter into a thin 8 inch round on one side of the griddle. Sprinkle a teaspoon of katsuobushi on the top. Place a handful of shredded cabbage on the pancake and 4 half slices of bacon on the cabbage. Allow pancake batter to set, about 5 minutes. Flip pancake over using 2 spatulas so that the bacon is now touching the griddle. Continue to cook for 4 to 5 minutes. In the meantime, cook a portion of yakisoba on the side (or in another pan) with 1 tablespoon mirin and 1 tablespoon okonomiyaki sauce. Cook 5 to 6 shrimps next the noodles. When shrimps curl and turn pink, transfer onto the fried noodles. Now, move the pancake onto the noodles. Crack an egg onto the side of the griddle and spread it out into an 8 inch round. Move the entire pancake (with noodles) onto the egg. Allow it to cook for another 1 to 2 minutes. Flip the completed okonomiyaki over. 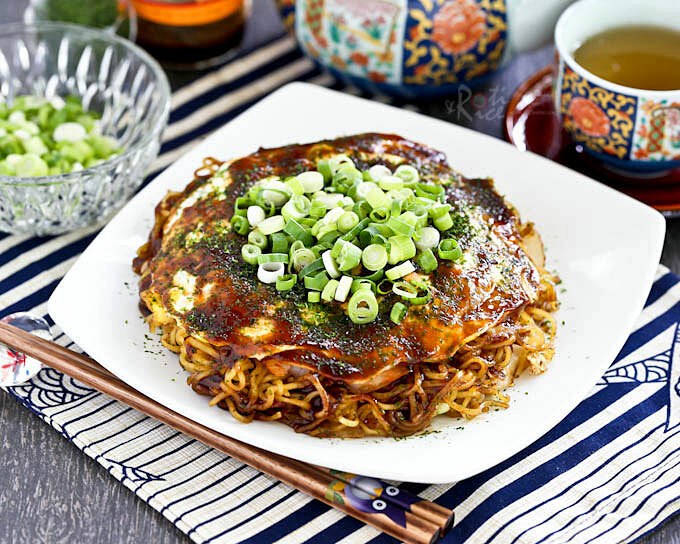 Drizzle or spread a generous amount of okonomiyaki sauce on the top. Transfer to a plate. Sprinkle with aonori (finely shredded green seaweed) and green onions. This is a full size Hiroshima Style Okonomiyaki (Japanese Layered Pancakes) served on its own as a main dish. Smaller pancakes can be made for snacking and Kewpie mayonnaise may be drizzled on the top if preferred. Could you make something a little more decadent? I don’t think so! 🙂 WOW! This looks incredibly good!